Automatically shuts down lighting and/or other equipment when a high temperature setpoint is reached. Once turned-off, the unit will run a user selected delay from 0 to 30 minutes before turning back on or will hold restart until manual reset (temperature setback of 5F or 10F/3C to 5C). 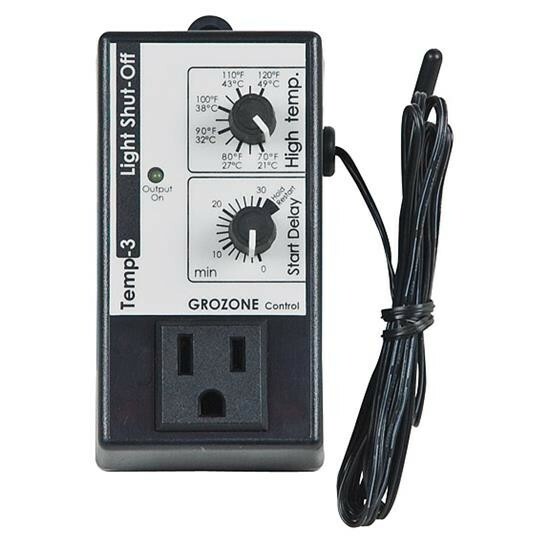 6 foot cord with temperature sensor precise to 2F/1C. Can power 120Vac equipment up to 15 amp. To be used in conjunction with 120Vac triggered high-load or light switcher like the LS1, LS2 or LS3. 3 year warranty.